Southerner, Civil War veteran, and American poet Sidney Clopton Lanier wrote reverently of the mysterious coastal salt marshes of Glynn County, Georgia. Had he explored a bit further north into the Lowcountry of South Carolina and Beaufort County, he would have found geographic boundaries made for little change in the marsh. He would have found the same shiny, sucky pluff mud with its distinctive brackish, sea smell, and the spartina grass protecting the vast wildlife that “swimmeth below” the surface. 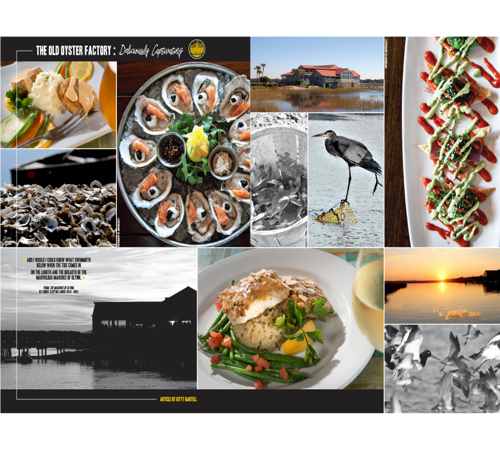 The Old Oyster Factory is situated amidst the marsh and grassy border surrounding Hilton Head Island’s Broad Creek, where the soul of the marsh is soaked into the very foundation of this singular seafood and steakhouse located on Marshland Road (marsh-land, indeed). Setting your navigational beacon for 32° 11’ 55.098”N, 80° 43’ 8.325W, you will arrive at The Old Oyster Factory’s front door and find yourself at the edge of one of Mother Nature’s most marvelous venues, where for 27 years, islanders and visitors have savored a fine, waterfront dining experience. The ground floor of The Old Oyster Factory was once the building’s only floor, and operated as a thriving oyster cannery. Bateau after bateau brought loads of freshly harvested oysters from the surrounding waters, where the wives of the oystermen shucked and canned the sweet meat and salty juices to be shipped up and down the southeast coast, and beyond. Closed in 1990 due to commercial development and natural selection, The Old Oyster Factory is truly a culinary destination and nature adventure, set upon and paying homage to its delicious Lowcountry seafood roots. Designed with various decks and walkways alongside the marsh and jutting out over the creek, the restaurant’s setting gives guests the opportunity to experience the unique nature of the area’s tidal ecosystem while waiting for their dining experience to begin. “We have families tell us one of their favorite things to do is to try and catch the fiddler crabs,” said Katie Manley, The Old Oyster Factory’s marketing director. On the occasion there is an unusually high tide, guests are cautioned that the one and only access to the the outside deck will be flooded for a short amount of time. Slipping out of their shoes and sandals for a short wade doesn’t concern most diners as they make way to their tables. Once seated, guests are treated to stunning water views from every seat, which also serve up a sunset view that is arguably one of the best on the island. “In the summertime we have entertainment on the back deck, including local musicians and juggler Ben Mathews. We also have a great view of the Shelter Cove fireworks every Tuesday night,” Manley said. With a public boat ramp near the restaurant, Island Explorer Cruises and Water-Dog Outfitter expeditions launching from their dock, the water-side activity is always engaging. Longtime executive chef and partner, Franz Auer, created a culinary tradition at The Old Oyster Factory based on consistency, quality food, and beautiful plates—and complimentary hush puppies delivered to every table, Manley said. Now retired, Auer transferred the reins to Chef Andrew Love, who worked with Auer for several years before taking over the kitchen. The culinary team at The Old Oyster Factory specializes in bringing out the best in all that “swimmeth below,” and they do a rather exemplary job of preparing selections for the non-seafoodies as well. Their menu offers a refined selection of all things seafood from Gulf Coast oysters, to day boat scallops, salmon and crab cakes, to lobsters, Lowcountry boils, and so much more. In addition to their sumptuous steakhouse selections, including filet, New York Strip, ribeyes, and a choice center cut, bone-in pork chops, the soups and the gumbo and the heavenly desserts are all homemade. The Old Oyster Factory also offers a bar and lounge menu with just-right lighter fare and nibbles to pair with their exceptional wine selections, cocktails, specialty drinks, beer, and more. Happy Hour is from 4:45 to 6:00 nightly, when their special offerings include $1 off beer, as well as $1.50 off liquor drinks and wine by the glass in the bar and lounge only. The Old Oyster Factory’s Sunset Dining will be ongoing throughout the summer. Check with the restaurant for times and make a reservation to set out for an earlier dinner that includes a selection of their menu’s entrées and starters, and a choice of iced tea, lemonade, soft drinks, or coffee, all included. The outside entertainment and marsh-side exploits will be waiting for your post-dinner enjoyment. 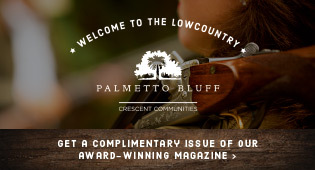 For more information or to make reservations at The Old Oyster Factory, located at 101 Marshland Road, Hilton Head Island, or one of their sister restaurants, Red Fish Hilton Head, Red Fish Bluffton, or Alexander’s, please call (843) 681-6040 or visit oldoysterfactory.com.